Your product caught customers’ interest and they’ve signed up for a free trial. But will you survive the test? How many of them will convert into paying customers? That depends not only on your product features but on a proper onboarding. In this article, we explore the best onboarding practices for increasing conversion. 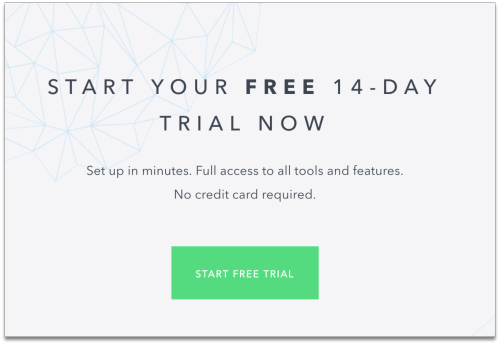 This is how we made our free trial CTA at HelpCrunch. We included a sense urgency (NOW), a contrasting and clear action button and encouraging details about the trial conditions. Keep signup forms short. 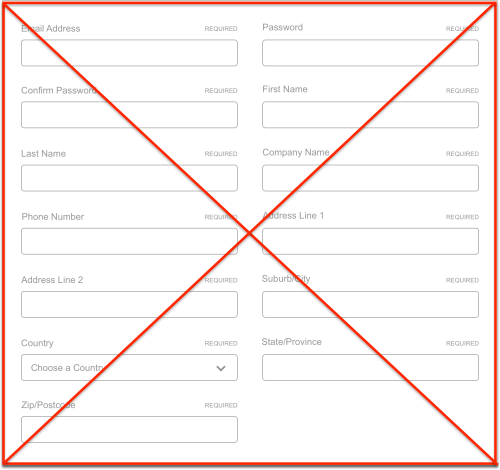 Don’t include many fields in your signup form and make sure it’s obvious which fields are optional because when users see a long form they normally assume they need to fill in all fields. That can be discouraging. Who’ll want to complete a form like that? Make fewer optional fields. Don’t try to squeeze everything in one go. Remember that every additional field makes you lose signups – you may ask for more information at a later stage. Do A/B testing to find an optimal balance. For example, the guys from Shopify reduced their signup form to just one field. PRO TIP You may decide to add more fields if traffic to your website is very high and you want to filter out accidental signups. To ask for the credit card details or not? Credit card details. You may want to differentiate casual signups from serious prospects by requiring credit card info. But will people provide such sensitive information before they even tried anything? Looks like a security risk. An undecided visitor may just ditch your product for another where signup is easy. PRO TIP If your traffic is very high and you ask for the credit card info, state clearly that users will not be billed automatically at the end of the trial. No credit card information needed before trial. As you see from our free trial screenshot above, HelpCrunch makes the subscription path for potential customers as easy as possible. And we also don’t recommend requiring credit card info if you are just starting up your business and don’t have many customers yet. Nurturing news signups throughout the trial is essential. Get people to discover, test and enjoy the value of your product to convince them it’s worth the money. Good FAQ section or knowledge base. Yes, that’s also part of onboarding! Modern customers are self-reliant to a great extent, many of them prefer figuring out how everything works themselves. Provide a comprehensive knowledge base or FAQ section. Warning! Make sure you don’t drive people crazy by long, overly technical, instructions. Your content should be well-structured, clear, and straight to the point. Add textual explanations and tooltips wherever a customer potentially may have doubts. Messaging campaigns. 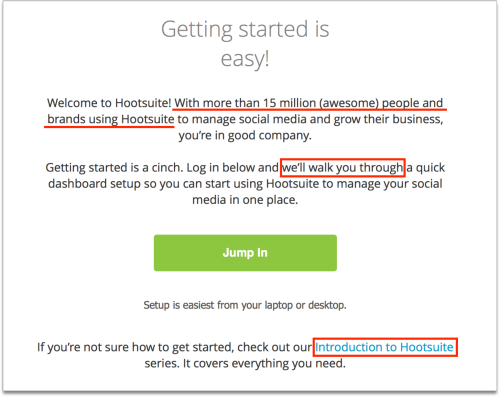 Of course, the FAQ section is not enough – you need a proper onboarding campaign. Automatic video walkthroughs are a great and ideal solution to quickly and natively onboard your users but are quite labor-intensive. Start with info blocks on every page of your website (what the page is about and what you can do with it). The most popular onboarding channel is email. But remember – one-size-fits-all campaigns don’t work. 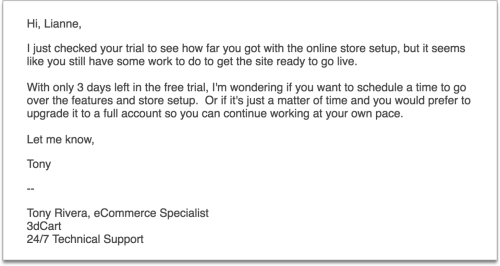 Generic emails based on how many days a customer is on trial don’t take into consideration how he/she is actually using your product or whether is using at all! Instead, your business needs to create a series of action-based emails. 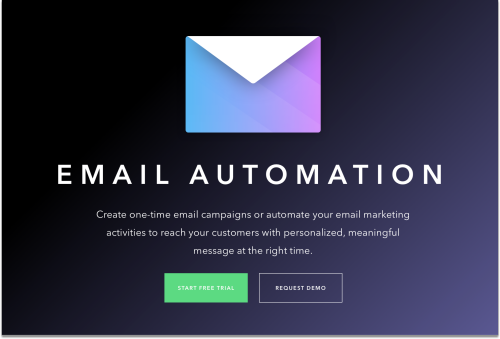 At HelpCrunch, we use email automation feature integrated into our own customer communication platform to track users’ behavior on our site and within our product and set triggers for sending a series of tailored auto messages. Triggered emails have a much higher open rate compared to traditional emails. To engage the customer immediately, it’s better to send an email right upon signup and then multiple emails throughout the trial. PRO TIP Don’t forget about formatting: include visuals, social buttons, play with fonts and styles to make your email engaging, readable and visually appealing. 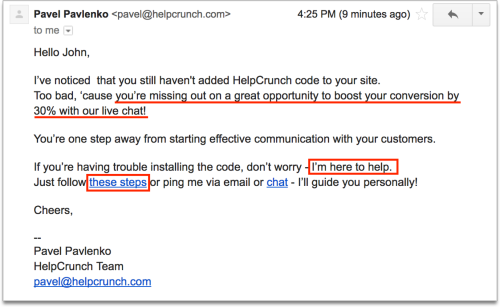 PRO TIP Consider offering concierge onboarding for more personalized support. At HelpCrunch, we offer a free personal onboarding assistant. Knowing the nature of the business and the goals of a given customer, the assistant provides a personalized guidance throughout the trial and helps fine-tune our customer communication platform specifically to customer’s needs. Users can get in touch with the onboarding assistant any time via our live chat, email, or over the phone. Moreover, people appreciate when our CPO personally welcomes them with an email. Abandoned signup email. If triallers did not start using your product in the first days, there’s little chance they will ever get to it again. You need to get people to test the product and complete mission critical tasks. At HelpCrunch, we have Last Seen и Sessions metrics, which make it possible to filter non-active users and target them with such emails. 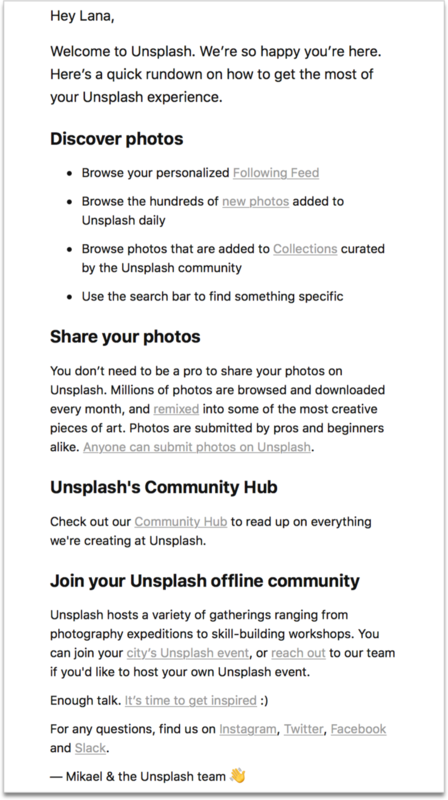 Also, you can forward your own custom user attributes to your HelpCrunch account and base your email and in-app chat campaigns on them. People active within the first 3 days of signup are four times more likely to convert to paying customers. Don’t let them fade away into nowhere. Tips and tricks email. If everything goes ok and the customer activated your product, assist him/her to get to know its functionalities and squeeze the maximum benefit. That can be done by sending an email with valuable tips on high-value features of your product, links to product guides, help materials, knowledge base, white papers or books etc. At-risk trial accounts. Use analytics to identify users that seem to be stuck and still have not used your product – and proactively offer help. Customer using your product. 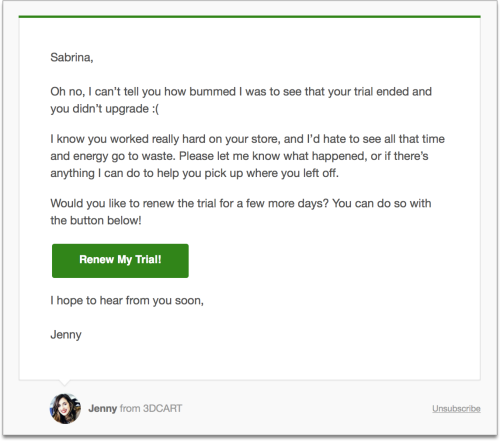 You don’t need to wait till the trial fully expires, you can invite trial users to upgrade earlier by creating a sense of urgency. Alternatively, consider offering a discount if they sign up on the same day. Trial expired email. Thank the user for trying your product. And again highlight its business benefit, illustrating it with numbers and/or social proof. Provide a clear and easy upgrade path. PRO TIP Make it clear whether the user will remain on the same plan as trial and how he/she can jump onto another plan. 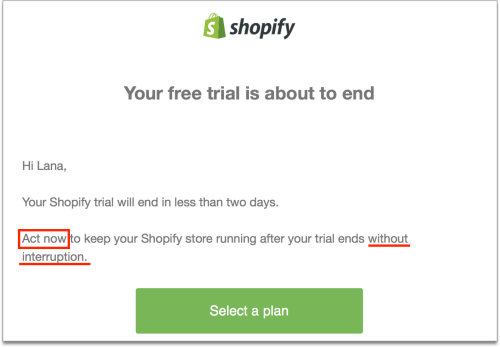 Consider offering a free trial extension to users who didn’t convert to a paid plan by the end of the trial. In exchange, you may request feedback as to why they weren’t ready to purchase. Look how 3dcart ecommerce-platform does it. PRO TIP You may also motivate users with a new feature that you’ve recently added or a discount. Summing up, if you want new signups to convert, you’ve got to keep communicating with them during the trial. 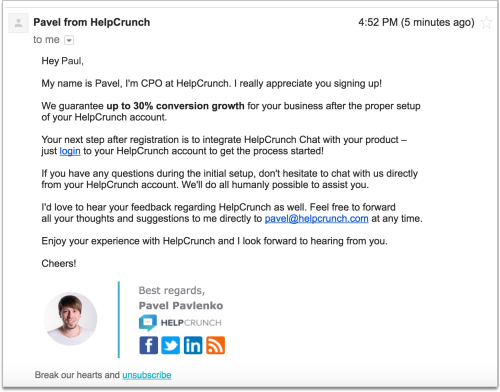 HelpCrunch is one of the best customer engagement and onboarding tools. P.S. Subscribe and get awesome blog posts about customer service, email automation, and startups.